Joe Raedle / Getty ImagesThe bridge was supposed to connect FIU’s campus to Stillwater, a city where many students live. The cause of the collapse hasn’t been determined. 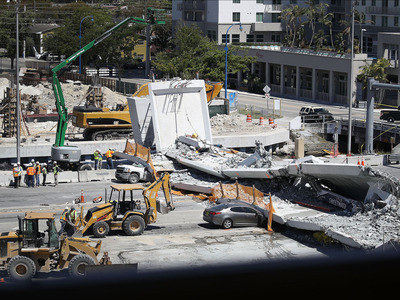 One survivor of the collapse, Florida International University sophomore Richard Humble, described the collapse and its aftermath in an interview with Today. He was being driven back from a doctor’s appointment by a friend, Alexa Duran, when the bridge collapsed on her car. While Humble was able to escape the car, Duran has not been accounted for by authorities. “I tried to duck, but at the same time, it was just way too fast,” Humble told Today. Humble’s mother, Lourdes, recalled Richard’s call to her after he escaped the car. “All he said is, ‘I have a lot of blood around me. It’s not mine, mum, I have a lot of blood,'” she told Today. The bridge was supposed to connect Florida International University’s campus to Sweetwater, a city where many students live, when it opened in 2019. Its supports and bridge had been constructed separately over the course of several months and installed in a few hours on Saturday. Recovery efforts began Thursday and continued on Friday, though Miami-Dade authorities don’t expect to find additional survivors. “Our primary focus is to remove all of the cars and all of the victims in a dignified manner and not compromise the investigation in the process,” Miami-Dade County Police Chief Juan Perez said during a press briefing on Friday. The cause of the bridge’s collapse hasn’t been determined yet, but the National Transportation Safety Board will conduct an investigation for around a week to figure out why the bridge collapsed and what could have been done to prevent it.